Hello, bloggers! 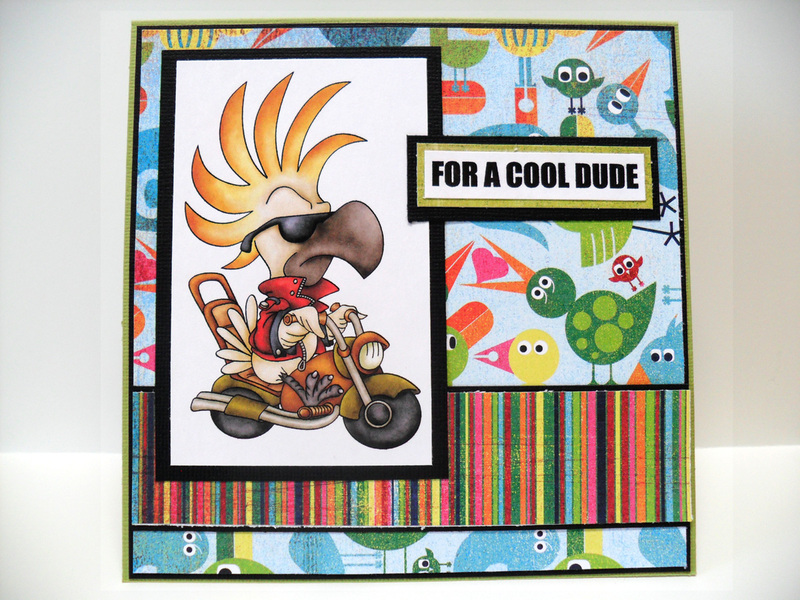 This week's challenge over at Lollipop Crafts is "For Him". I used a digi from The Paper Shelter called Cockatoo Rules. I fell in love with this guy the moment I saw him! I think he's just hilarious with his spiked feathers on top, his shades, and his leather jacket. My boyfriend -- like many men -- wants to one day buy a bike. So, I immediately though of him when I saw this digi. What I also love about this digi is that it comes in a colored version! I love my Copics, but sometimes, I'm just really not in the mood to color. I loved that I was able to size this digi, print it,and not have to fuss with coloring. For my pp, I turned to my stash and used one of my all-time favorite Basic Grey lines: Lime Rickey. I bought every single piece in the collection. Okay, I've done that with a lot of Basic Grey collections, but with Lime Rickey, I even bought multiples of many of the pieces. The one sheet from the collection with the birds on it was perfect for this card. I matted a strip of the colorful, rainbow paper and used it at the bottom. In my mind, it's the road that the bird is riding on. LOL The sentiment was computer-generated. oh my golly this is just too darn cute!!! love the basic grey paper- really compliments the stamped image! !